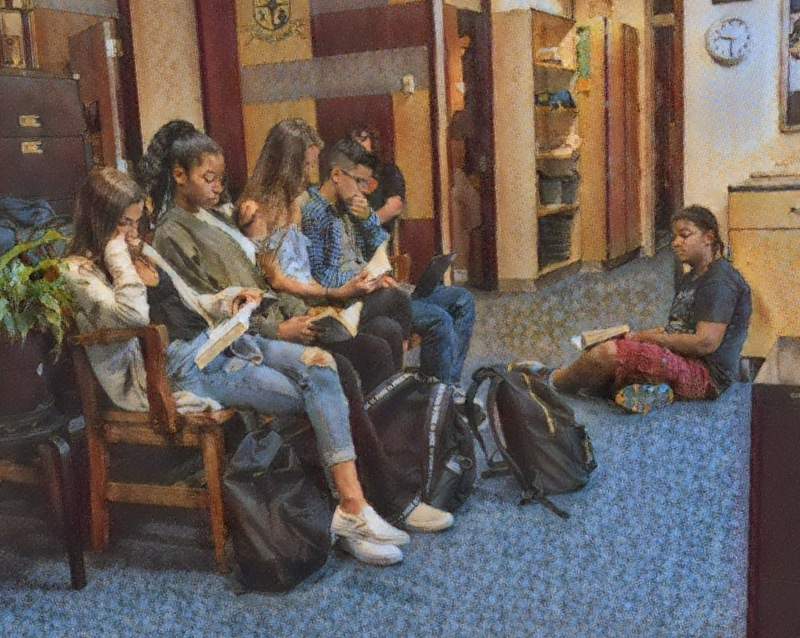 Students read while they wait for counselor meetings. Reading in my classroom is about choice, flexibility, and above all, driven by student interests. We read at the beginning of each class period and I regularly spend some of that time helping students find books they will like from our classroom library. Most of my students read much more than they did the year before. They get better at making their own reading choices. And, at this point in the year, they are better at making suggestions to each other than I am. We take books when we need to visit the counseling office for a full period of articulation meetings. I've found students reading on the 40 yard line during disaster drills. One student even carried his book to and from the bathroom because he wanted to read while he walked. Reading is happening for my students and I love it. But...you knew there would be a but, right? Among all this reading nirvana I also saw a lot of reading bubbles. Students get used to reading a particular author, genre or series and stay in those bounds. Some series can go on for quite a while, five, six books or more. When students finished a book or series they liked they always wanted a new book, "just like that one." 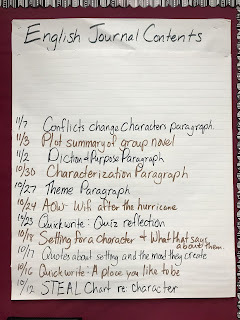 I needed to get them out of these ruts filled with princesses, disaster zones, and zombies that so many had fallen into, so I wrote a list of reading challenges. To be clear, the idea of reading challenges is not mine. 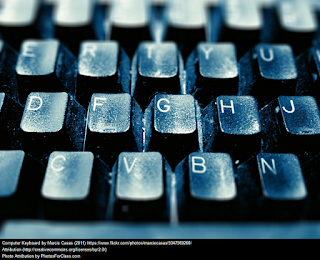 Just google [reading challenges] to find lots of ideas. I did a search and then built my challenges chart by adapting a variety of what I found to a list that would work well for my students. It also happened that I did this on the day we were scheduled to visit the library. 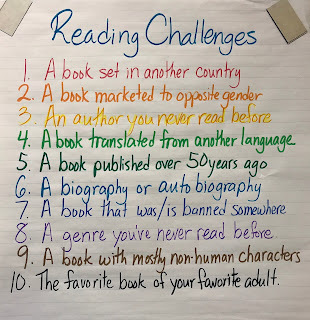 I had visions of my students wandering the stacks aimlessly, so in part, these reading challenges were a desperate effort to make our library time more purposeful. It worked. I made this chart a month ago and since then many of my students have stepped out of their reading bubbles, considered books they might not have read before, read things they would not have otherwise picked up, and generally expanded their horizons. 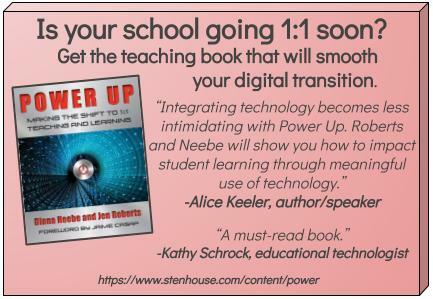 When I introduced this they had two choice books left to read for the school year. For their first one about half my students went with the "author I have never read before" option, an easy way out, but that just meant they had to work a little harder to find their next book which would meet one of the other nine challenges. 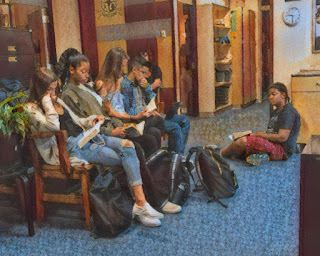 Suddenly students were looking for books set in other countries, exploring autobiographies of Tony Hawk and Malala Yousafzai, enjoying The Alchemist, and digging into classics like Wuthering Heights. ("I've always wanted to read this," she said when we found it in the library that morning.) And my favorite, the boy who decided to try Rain of Gold when I told him our school security guard considered it his favorite book. 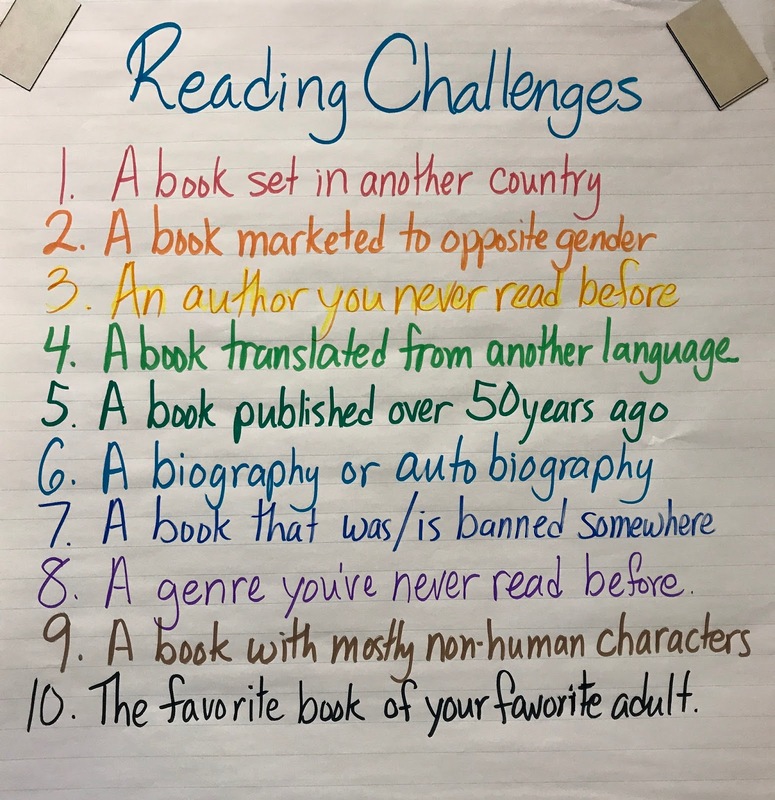 I still believe students need to have choice in their reading lives, and now I know I can nudge those choices with some well chosen challenges.